Separate flow and temperature controls. Maximum temperature stops to prevent scalding. 5 mode handset. Height adjustable riser rail. Compatible with gravity fed, pumped gravity, unvented, mains pressure (thermal store) and combi boiler systems. 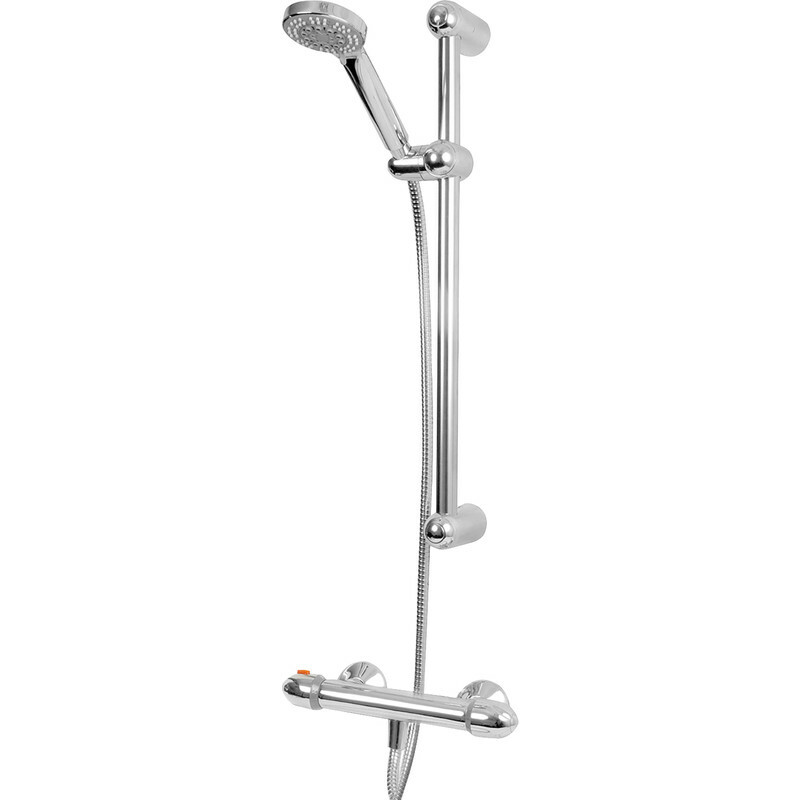 Thermostatic Bar Mixer Shower Valve & Kit Chrome is rated 3.8 out of 5 by 12. Rated 5 out of 5 by Dogchops 100 from Budget shower Purchased to replace a faulty shower in a house that was being sold. It does differ from the online picture and is obviously an entry level shower. I probably will never find out how long it will last! Rated 3 out of 5 by Zayn from Defecting problems with valve I have always had problems with showers bought previously can't tell yet with the new shower just fitted. Rated 5 out of 5 by Anonymous from Great for the price Just fitted today. Great shower for the price. Rated 4 out of 5 by JennyG from We have a shower again! Plumber fitted it for us in 15 minutes flat. Only needed to use the thermostatic bar though as that's the only thing that broke. Smooth movement on the handles. Only issue is an end cap is missing to cover the temperature control screw. Rated 1 out of 5 by Toolstation7878 from Terrible quality Not impressed. 1. Didn't get the one pictured (mine came in a blue clam shell packaging and don't match the one pictured). 2. The end cap on the shower valve fell off instantly, so had to silicone back on. 3. Shower hose was short and felt cheap. 4. Shower raiser rail didn't hold/ fit shower head very well and wouldn't stay straight 5. This was more expensive than the other generic shower valve so would assume would be better, however the cheaper one was far better quality when I bought a few weeks ago for another job. Can't comment on reliability, as does seem to fuction, but won't be buying again with all the other problems.